A Redditch estate agents will be setting up a pop-up café this Halloween in an effort to raise money for Acorns Children’s Hospice. Leaders, which is based in Church Green East, is to open its spooktacular café on Saturday 29th October. A team will be on hand to serve a range of hot and soft drinks, as well as a selection of cakes, sweets and treats. Amanda McNaughton, branch manager at Leaders in Redditch, says: “We would love to see as many people as possible at our pop-up café to enjoy a terrifying tea, a creepy coffee or a hair-raising hot chocolate. 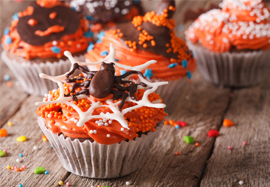 “We will also have a great selection of delicious treats on offer, making it the perfect place to stop for a bite to eat ahead of the spookiest day of the year. Leaders has pledged to raise £50,000 for Together for Short Lives in 2016 and is well on its way to achieving the goal. This comes on the back of a successful partnership in 2015, during which it raised a total of £45,000 for the charity. Acorns provides specialist medical care for life limited and life threatened children and young people and support for their families. It provides this care for families across the West Midlands at its three hospices and in the community.